Upon graduation from the Medical University of Gdańsk, our alumni enter diverse working environments, follow different paths of postgraduate education, become partners for graduates from a variety of other universities and serve varied patient populations. 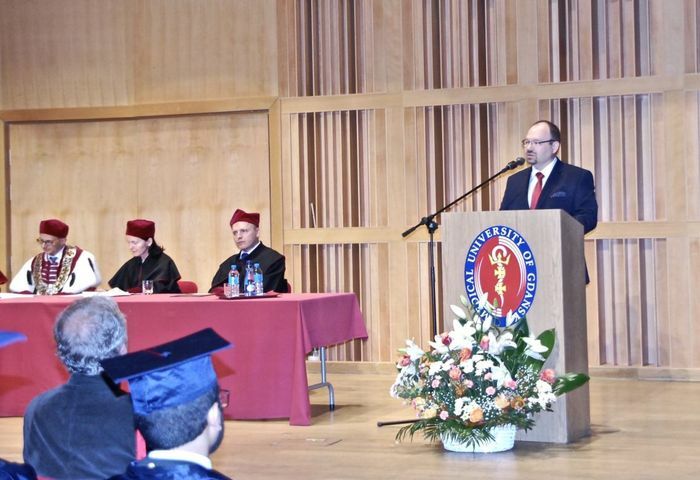 In all these professional situations, as well as in private life, our alumni continue to be key ambassadors of the university in countries outside Poland. Your talents and hard work, supported and developed by the joint efforts of the academic staff of their home University – MUG, have brought you to levels of knowledge, skills and ethical profile which proved to be a good starting points for your successful careers. Along with continuous pursuit of higher quality in education, science and medical services, reflected in progressively higher position in national and international rankings, the Medical University of Gdańsk intend to develop long-lasting and mutually beneficial relations with our international alumni, medical professionals in various countries around the globe. We wish to communicate to you the good news about positive changes within the university, announce interesting events concerning education, science and medical care, as well as to encourage your participation in MUG’s educational and science projects and social events addressing both international alumni and the whole academic community of MUG. We are convinced our alumni’s experience as students of MUG can be a valuable source of feedback to be used for continued development of our teaching programmes, syllabi and campus life. The university would also benefit from feedback information on your experience of entering various healthcare systems and postgraduate training schemes and your self-assessment of competence compared with other colleagues who were exposed to different curricula and teaching methods, e.g. Problem-Based Learning. For successful management of the relations with our international alumni, since 1st September, 2018 the university appointed me, to hold the position of International Alumni Relations Officer. Building upon several years of my friendly contacts with students of the English Division and the mutual respect we have had for each other, I truly hope our dear alumni respond to our encouragement and wish to keep in contact with their home university. I will greatly appreciate news from you all about your careers and success stories, as well as your suggestions of improvement at our university and activities or projects organized at MUG which you would recognize valuable and interesting. Let us keep in touch and enjoy each other’s successes together!